If you are looking for the most badass custom tunes that are easily loaded to your RZR from the Dynojet Powervision, you've found them! 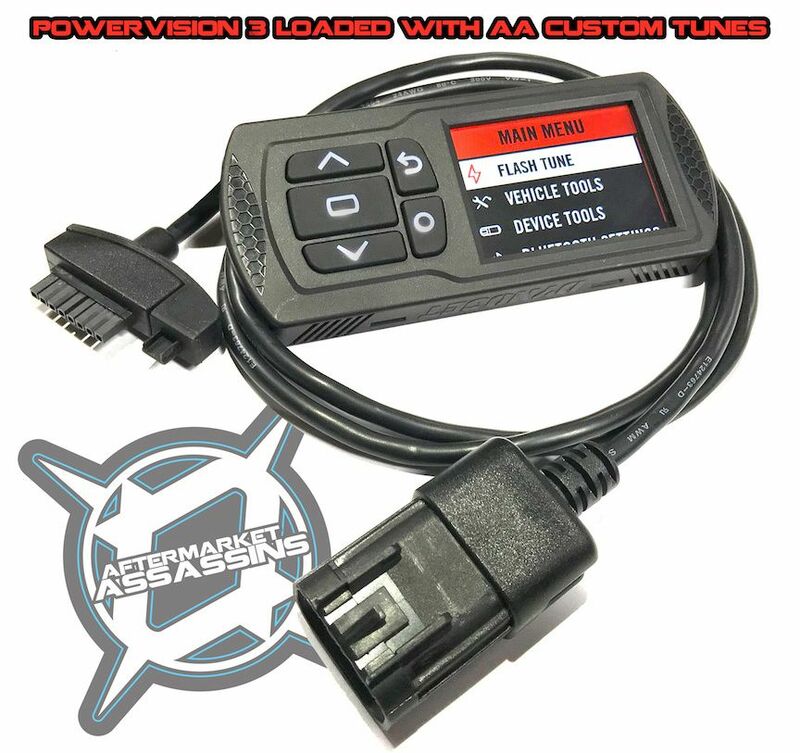 AA's performance tunes are offered loaded directly on the Powervision ECU tuner. This versatile tuner allows our tunes to easily be uploaded to your factory ECU, switch between tunes, and even return to stock. The Powervision is also a great gauge showing boost, timing and more. You can leave the Powervision hooked up for gauges, or completely remove it after flashing your ECU. The Powervision also has excellent data logging capabilities if you download the software, and use your laptop. You can even view trouble codes and erase them on the fly. We are highly experienced in tuning these RZR's and that will show. Our tunes are simply set up correctly, and everyone with a Powervision should have these tunes! They are also easily labeled and will show rough horsepower claims with supporting mods such as exhaust and clutching. These tunes modify all the necessary maps to create big horsepower, while still maintaining a reliable and safe RZR. Each tune is built specifically for your Powervision allowing us to change the fan temp or other parameters if needed. No mess of having to send in your ECU & this device is a much safer way of programming. Simply plug in to your Diagnostic port, click tune, wait, and go ride! 1 Tune(along with your stock tune) are included in the initial price. Additional tunes are $50 each. We would highly recommend 2 tunes so you have good options if you run into poorer fuel quality. All tunes level 3 and higher will need the waste gate rod adjusted shorter for maximum power. See this VIDEO on how to adjust it. The Level 1 tune is a modified stock power level tune, but has better boost maps to help keep you in the power. We disable many limiters, up the speed limit, rev limit, and make necessary fuel & timing changes. The 2017 factory tune runs a max of 15-15.5psi of boost, and we keep that in this tune, it's just easier to obtain & maintain that level. The Level 2 tune offers 16-16.5psi of boost and a 10-15rwhp gain. This tune can be used with the stock or aftermarket exhaust. Clutching is highly recommended with this tune, as just tuning the machine will not properly transfer the power to the ground. 91 Octane tune. The Level 3 tune is a game changer! Hitting hard at +20-25rwhp, this tune offers the highest boost possible(17-17.5psi max) on 91-93 octane fuel. Due to the thicker head gasket and larger injectors on the 2017 models, we are able to get away with his kind of power on pump fuel. These are absolutely huge power gains that will have you grinning from ear to ear. This tune must be used with an aftermarket exhaust and requires clutching. 91 non ethanol/non oxygenated fuel, or 93 octane is required. If fuel in your area is poor, we'd suggest using a half can of VP Madditive or Torco Accelerator to help fuel quality. 1/2 gallon of 110 or better race fuel would also work to boost octane levels. DO NOT USE ANY AV GAS WITH THIS TUNE OR ANY TUNE NOT DESIGNED FOR THAT FUEL. Waste gat rod adjustment is needed for maximum gains. Billet BOV is also recommended. The Level 4 tune runs on 97-100 octane fuel and hits around 18-18.5psi max boost on race fuel. From testing, we know that this is the limit of the factory turbo before it becomes inefficient and simply starts blowing too much hot air. We correct many maps for this octane rating, assuring the most possible power. This tune pack a huge punch with just a small amount more octane. To reach the 97-100 octane rating, we would recommend a can of TORCO accelerator or VP Madditive. You can also use 2 gallons of 110 or higher race fuel per tank... all mixed with 91 octane fuel. Exhaust and clutching are needed with this tune. Waste gat rod adjustment is needed for maximum gains. Billet BOV is also recommended. Level 5: get ready to drop the hammer! If you don't like to lose races, this tune is your friend.... and If you're friends don't like to lose either... they might not be your friends for long. This tune is developed for 110 octane fuel (unleaded is recommended if you are keeping you plan on running your o2 sensor) and really hits hard. This tune runs around 18-18.5 max psi. This is where we found the turbo to max out for the most part, so we went to our timing tables and did some work. Adding a revised timing curve with these boost pressures is a recipe for absolutely stupid power that hits harder than you can imagine. Exhaust and clutching are needed with this tune. Waste gate rod adjustment is needed for maximum gains. Billet BOV is also recommended. Level 6: Have E85 local to you? Time to fill up and start turning heads! This tune is developed on the stock injectors and stock fuel pump for E85 fuel... thats right, just gas up and hammer down. E85 is a great race fuel replacement as it runs very cool and can sustain high boost and advanced timing maps..... which equal awesome power! We crank out all our level 5 tune has and even a little more. Keep in mind E85 takes about 30% more fuel to run, so it will guzzle fuel fast. This tune runs an average of 18-18.5 PSI of boost and will require you to adjust the waste gate. Max boost levels are listed as reference only. Altitude, temperature, charge temps, intercooler temps and many other conditions play into a factor of final boost output. AA tunes do a better job of making sure you reach these levels as the factory tunes are overly safe, and have the EPA to deal with. Why our tunes over the dynojet tunes? This really depends on our tune level. The great thing with our tunes is they are easily labeled, list boost numbers, and rough horsepower gains. They have been proven to make and hold power longer than the dynojet tunes. Not only this, but we test with clutching, exhaust, and other parts to ensure our tunes work well with all factors. Dynojet actually requests a ton of boost in their tunes, and the dyno backed up our statement that more is not always better. You can see power climb quickly and make good number, but then fade very quickly. This is due to too much boost request and the turbo not being able to hit that number, or handle it. Our safer tunes will hold power longer, and be much easier on your motor & turbo. When your RZR detunes or starts blowing too much hot air because boost is too high for the modifications or fuel, it can become slower than stock! Since we have so much time on RZR's, we know the limits and can push the limiters further giving you higher speed limits, and many other things hidden in our maps. Everything is taken care of for you, ensuring you have the best tune(s) out there... that should be worth every penny! If you have any other needs in these tunes, or any concerns; please e-mail! Oh... and get ready for your RZR to flat out rip!